This is Part 2 in a series on coaching collaborative teams in professional learning communities. To view all posts see Coaching in a PLC at Work™. 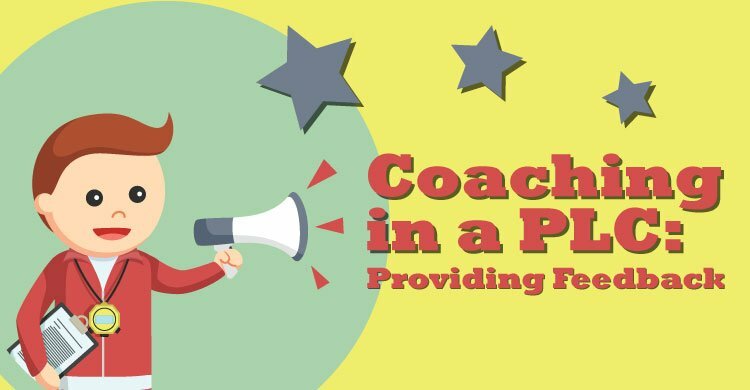 In order to maximize the growth of collaborative teams in a professional learning community (PLC), the influence and support of a coach is a foundational element to success. Regardless of who fills that role—a school administrator, instructional coach, department chair, or teacher leader—coaching matters to the implementation and sustainability of high-functioning PLCs. In the book, Amplify Your Impact: Coaching Collaborative Teams in PLCs, my co-authors and I lay out how districts and schools can use the cornerstones of clarity, feedback, and support to coach collaborative teams in a PLC at Work™ to high levels of effectiveness. So, what skills or mindset must a coach have in order to provide feedback in a PLC setting? Working with a variety of collaborative teams is exciting. Based on teacher skill set, individual personalities, and team dynamics, each collaborative team is unique, often functioning in different stages of implementation. This variance is both predictable and normal. As a coach, one must acknowledge this difference and work to provide differentiated feedback tailored to meet the needs of each particular team. Assuming positive presuppositions is important, knowing that teams are doing the best they can with what they currently know, and they will do better when they know more. Feedback to collaborative teams, at a minimum, is best when anchored to the following five essential prerequisite conditions of establishing a PLC (DuFour 2015). Educators work in collaborative teams and take collective responsibilities for student learning rather than working in isolation. Collaborative teams monitor student learning through an ongoing assessment process that includes frequent, team-developed, common formative assessments. The school provides a systematic process for intervention and enrichment. In our book, my co-authors and I take clarity a step further by defining a process to create a Strategy Implementation Guide (SIG) to develop a progression of behaviors and skills connected to the five essential prerequisite conditions of establishing a PLC. In essence, it becomes a baseline road map for PLC implementation. 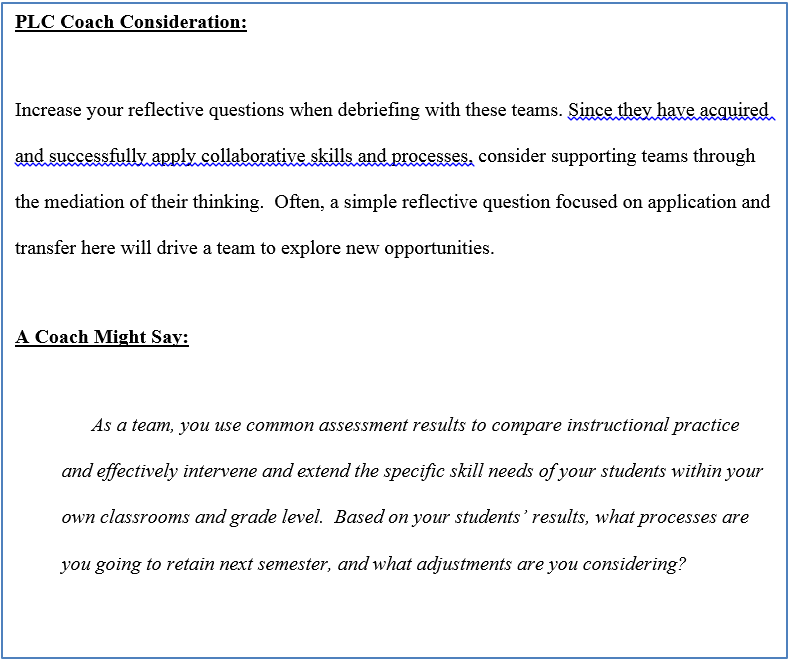 When coaches align feedback to an agreed-upon standard, whether a SIG or the five prerequisites shared above, they are better able to ground teams’ work and provide intentional feedback. As early as the 1970s, Thomas Gordon and Noel Burch wrote about the Four Stages of Competence related to new-skill acquisition and application (Gordon & Burch, 1974). These four stages are illustrated below and are equally relevant today when coaching collaborative teams within a PLC. When teams are in the initial unconscious incompetent stage, they can be unaware of the collaborative skills and behaviors required to be effective. As their awareness increases, they progress to a conscious incompetence stage. This is a space where teams recognize what they should be doing; however, they struggle to actualize associated practice. As teams receive support and deliberately practice, they incrementally improve to the third stage, conscious competence. In this stage, their collaborative practice is more competent; however, they may still lack automaticity and demonstrate gaps in practice. In the fourth and final stage, unconscious competence, collaborative teams function with automaticity and have a deep toolkit to execute the collaborative behaviors and skills necessary for a PLC focus on learning, collaboration, and results. Teams tend to naturally move forward and backward among the four stages, depending on the skills and behaviors they have begun to master and those that are new attempts. A coach who holds the four stages of learning as a reference point is equipped to provide differentiated feedback needed to spur growth of a collaborative team. More direct feedback is warranted for teams operating in the unconscious incompetence and conscious incompetence stages. These teams are often in their infancy of PLC implementation and are seeking guidance and specifics. When coaching these teams, one might hear responses and statements from the team such as: “What are our next steps?” “What should we do?” “Tell us what it looks like!” For the coach, these questions signal the need to operate from a consultant stance and provide expertise on next steps. 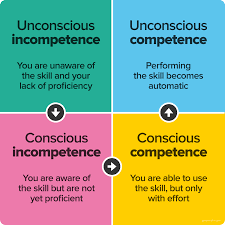 As teams move to the third stage, conscious competence, team efficacy increases as they gain new skills and behaviors to work collaboratively within the four critical PLC questions. They demonstrate effective levels of collaboration; however, they may also lack consistency in their approach. When coaching these teams, one might notice teachers willingly share ideas and participate but have yet to reach a level of automaticity. Teams here can benefit from a coach engaging with them in a collaborative side-by-side stance. Collaborative teams in the fourth and final stage, unconscious competence, are high-functioning. 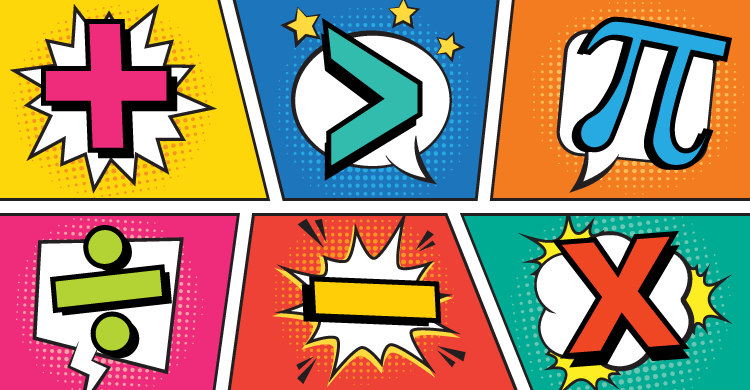 Chances are, they have embraced the tenets of PLCs for several years and are immersed in deep collaboration around the four critical PLC questions. At this stage, teams benefit from a coach who engages them from a reflective stance; however, a team’s efficacy can change by a reflective question that challenges their current paradigm. Even when the most confident and capable practitioners engage in new learning, it can be humbling. In these situations, connecting new learning and approaches to existing schema and knowledge is an important part of the process. Indeed, providing feedback is a fluid, ever-changing process. As a coach, feeling efficacious about your skill set related to providing feedback to teams will take time and practice. Don’t give up! You build a deeper understanding each time you engage with it. In the end, PLC implementation cannot be left to chance. Strong PLCs don’t just grow and thrive on the hope of a committed leader or group of teachers. 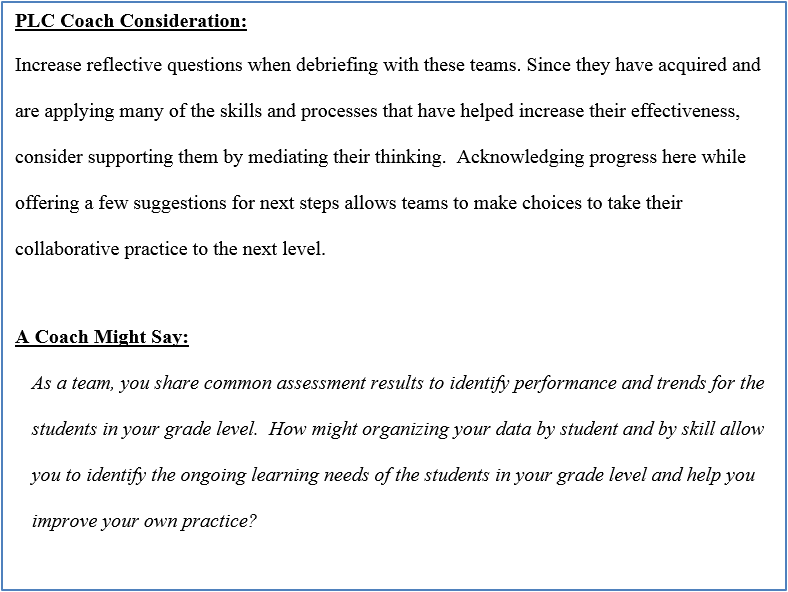 They require coaching to provide clarity, feedback, and support to strengthen collaborative practice for student learning. DuFour, R. (2015, May 8). In praise of American educators: And how they can get even better. Speech presented at the Summit on Professional Learning Communities at Work, Phoenix, AZ. Gordon, T., & Burch, N. (1974). T.E.T. teacher effectiveness training: The program proven to help teachers bring out the best in students of all ages. New York: Three Rivers Press. Many, T. W., Maffoni, M. J., Sparks, S., Thomas, T. F. (2018). 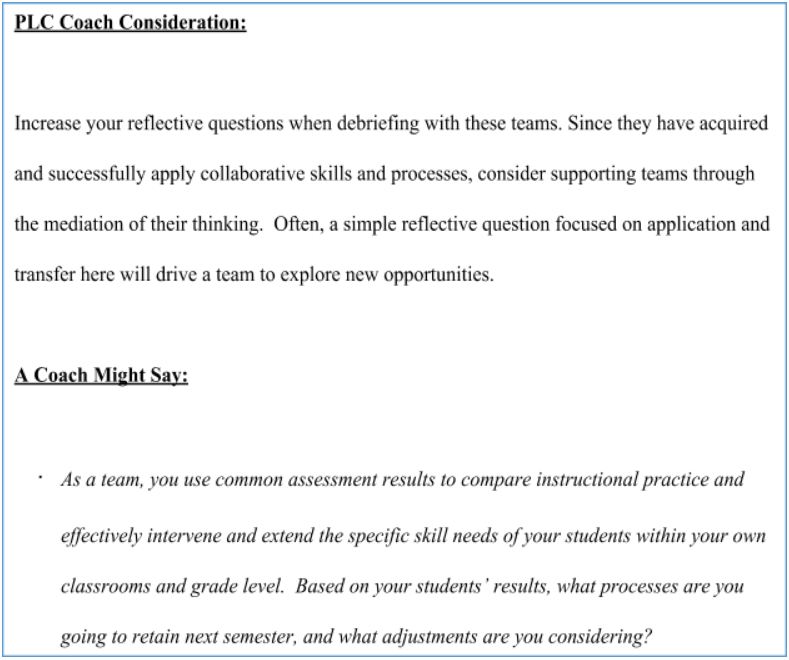 Amplify your impact: coaching collaborative teams in PLCs at work. Bloomington, IN: Solution Tree Press.